From time to time some people do fall asleep during my message on Sunday. Every pastor has to face the fact that it will happen and get over the distraction of totally boring some people, but there are some people who have my permission to sleep (and even snore if necessary) in church. They slip under the radar of most church attenders, but these are the ones who by their very presence preach to me, while I preach to them. For instance last Sunday Ed Gilliand and Chuck DeVane both told me, at separate times that they worked until 3 a.m. on Saturday. 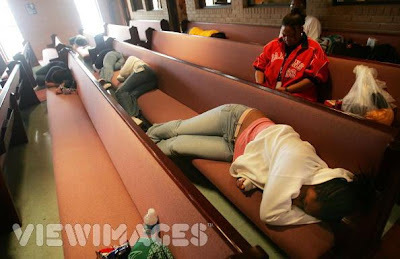 I told them both to feel free to take a nap in church, they had my permission. Also, a few weeks ago Polly Bee Amato was caught sneaking into church still in her scrubs from working a 12 hour shift in the Trauma ICU unit. I can't even imagine how tiring that must be, but these people speak volumes to me of what it means to be faithful. So (those of you who are too quick to judge) the next time that you see someone sleeping in church sit in awe of the faithfulness of these faithful few who serve past the point of exhaustion.